“A picnic with Emma” is the theme for a historical dance I am going to attend this year. It is inspired by the novel Emma by Jane Austen, published in 1815. A picnic as a theme for a dance means that the participants won’t wear ball gowns and evening suits. They will be dressed for an outdoor activity: A walking dresses for ladies, a riding habit for gentlemen. Creating a walking dress for 1815 immediately fired my imagination. 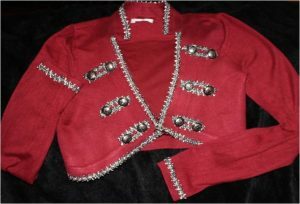 At the turn of the 19th century, the short Spencer jacket had become fashionable, and with the final victory over Napoleon at the battle of Waterloo in 1815, military ornaments embellished female fashion. I also would need a bonnet. Here is a rough sketch I made (photo on the left). to ask my friend Lucia for help. So far, two ball gowns and one riding habit were successfully created this way. You can see them here, here and here. Would it work again? 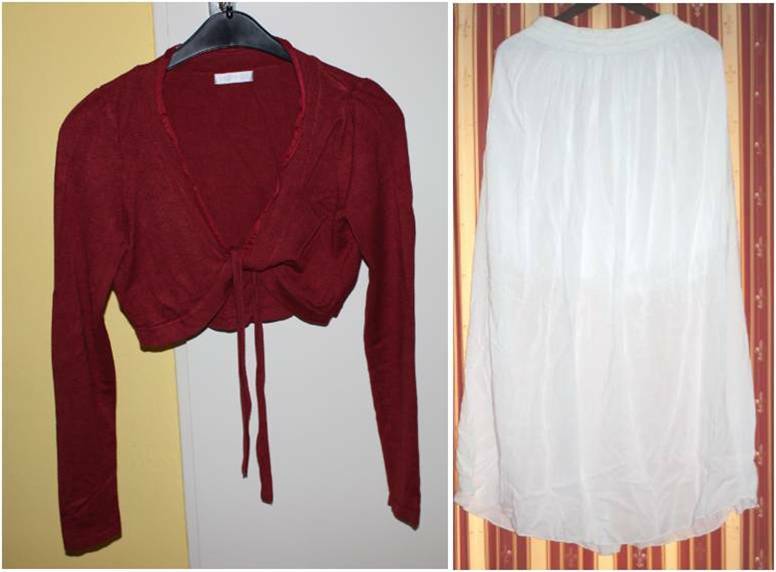 The search for relevant clothes in my cupboard revealed a white underskirt and a red jersey bolero. That’s not much to start with. I had some serious shopping to do – but mind you: it’s shopping on a tight budget. 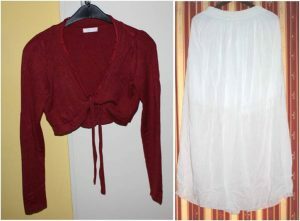 For the dress and the Spencer jacket, I would need a plain white dress, lace, an ornate braid, and buttons. Summer sale provided a cheap beach dress. It’s not great – actually it’s totally dull – but it is excellent for the purpose of turning it into a historical costume: It is made of cotton and has a lace pattern. Thus, it comes with a historical look and feel. 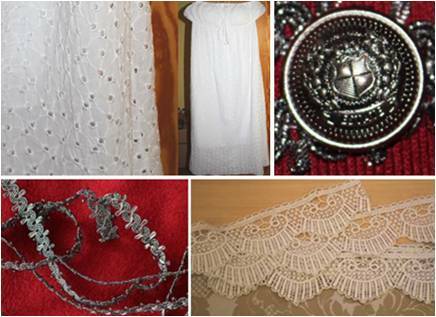 I found the lace and the braid at a flea market. Historical looking buttons can be rather expensive, and I needed 12 of them. 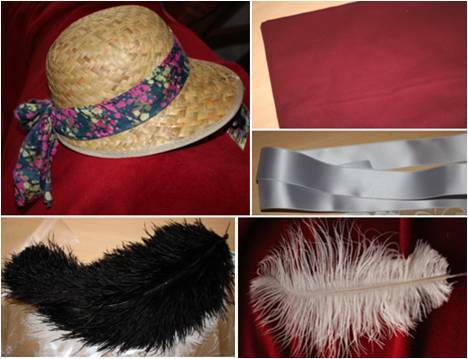 They are the most expensive items of the costume. I bought them at a haberdashery. For the bonnet I wanted to use a straw hat. Covered with red cloth, and adorned with ribbons and dashing ostrich feathers it would make a great 18th-century-style hat. The straw hat turned up at the DIY store. It even had a bonnet-like shape. It wouldn’t be too difficult for Lucia to enlarge the brim with cardboard – I thought. I got the red cloth for covering the straw at a textile shop. A colleague kindly provided black feathers. She had found them in a box at her attic. They were a bit dusty, but turned out fine after a gentle bath in warm water. White feathers in various sizes are usually available at craft shops. I still had some in stock from a previous ball. Lucia bought the ribbon for the bonnet once we had decided that the ribbon should match the braid and thus be of a light silver colour. The buttons were too heavy for the light jersey bolero. I had to bolster the front with black stretch fleece. Bolstering the bolero had the additional effect of creating a firmer, thus more military look as the stretch fleece helps to keep the light jersey cloth in shape. It sounded rather easy to turn a straw hat into a bonnet. How difficult could it be to enlarge the brim by 5 cm and cover everything in cloth? I soon was to find out it was tricky. The bolero Anna had found in her cupboard had strings – very unhistorical and not typical for a Spencer jacket at all. However, the strings came in handy as the bolero lacked a collar. I cut the strings off and sewed them on as a collar. To achieve the military look Anna wanted I added braid ornaments to the front, to the collar and to the sleeves. The front is also adorned with buttons, six on each side. As mentioned above, I bolstered the light textile with fleece. The front can be partly closed with hooks and eyes. It does, however, allow glimpses at the décolleté – or rather the white cotton gown Anna wears beneath. If she chooses to, Anna can cover the décolleté with a triangular red cloth fixed inside the front by unhistorical but convenient snap buttons. The cotton dress was easy to do. I basically had to sew the lace onto the hem. Anna had bought 4 meters of lace, which was enough for a double row of lace. The result looks really lovely. I think I have captured the spirit of Anna’s sketch. I had never tried to create a hat before, but Anna made the project sound easy. So I endeavored to enlarge the brim by 5 cm with cardboard. Well, the cardboard-part was tricky. 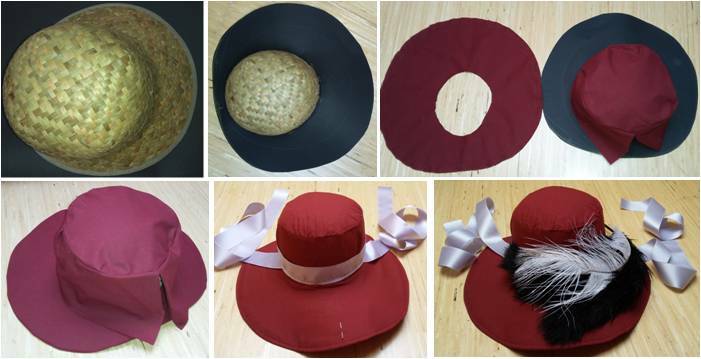 The bonnet is not perfectly round, it’s oval. I found it surprisingly difficult to enlarge the brim in the correct shape. Once this was done, it took some time to fix the cardboard to the hat without bulges. To cover the hat in the red cloth Anna had bought, I worked in two steps. First, I made the cover for the cap. Then, I made the one for the brim. When it came to joining both parts, I realized that the bonnet was too bumpy to fit under my sewing machine. The solution was to place the sewing machine beyond the edge of the table. I then could move and turn the bonnet under the presser foot. Adorning the bonnet definitively was fun. I chose a light silver ribbon and sewed it onto the hat so that Anna can tie the strings in a bow under her chin. Fixing the ribbons was tricky again, but as I had already worked out how to fit the bumpy bonnet under the sewing machine, all went well. The black and white feathers look gorgeous. I fixed them with a few, simply stitches. Anna: When being outside, a lady would were her neccessaires in need a little portable bag, a so called reticule. Lucia had made a cute red reticule for my red empire-style lace dress. It matches perfectly with the walking dress. 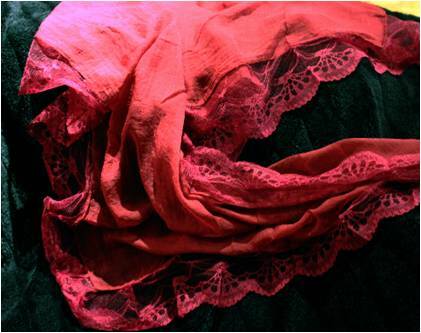 Lucia also provided a kind of textile nose-gay: A cloth square filled with dried roseleaves. It smells lovely of sweet June. I will take it with be to be in ever closer contact to romantic nature. Red shoes are also available from a previous ball. 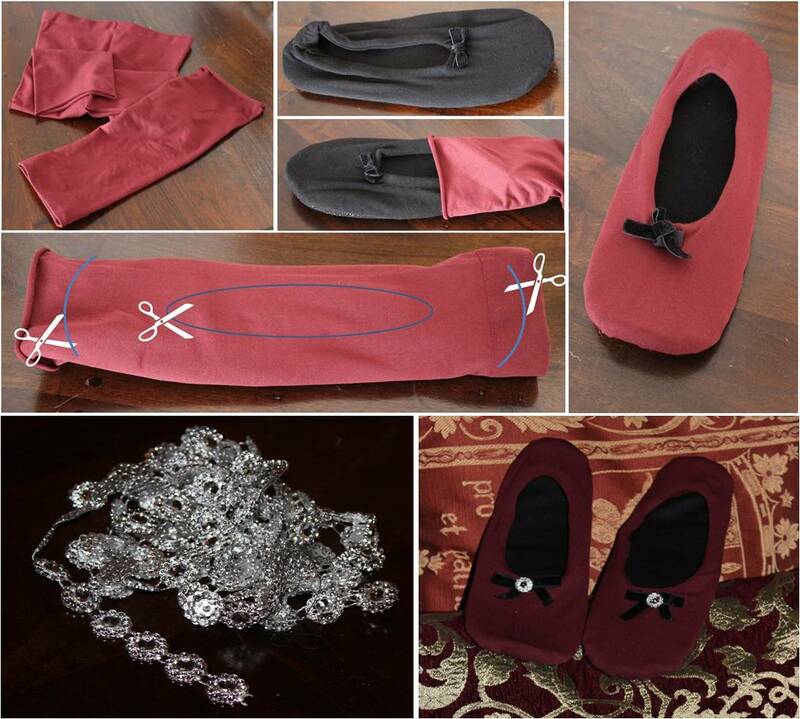 I had made them from red tights and simple cotton house shoes. 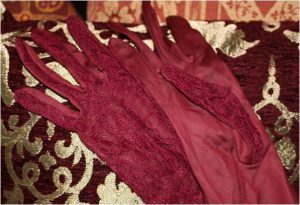 The gloves are another find at a flea market whereas the shawl is a luxury item. I couldn’t resist buying it as it has the perfect size and the perfect shade of red. 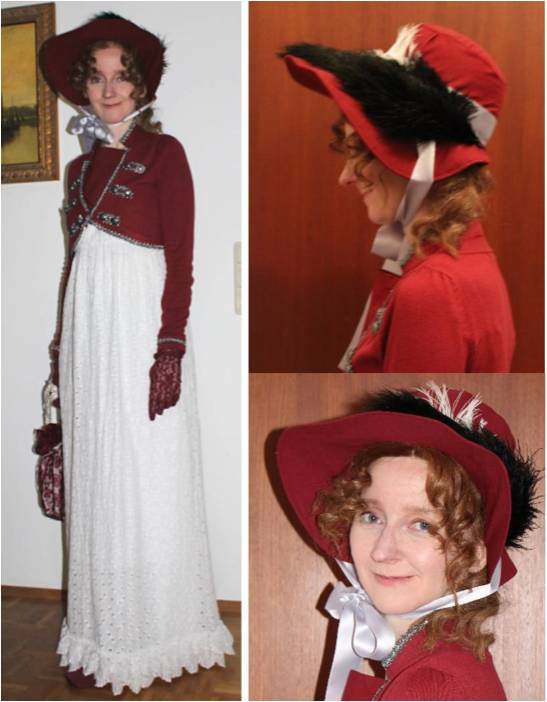 Here is my walking dress for a picnic in 1815.